It is called a health clinic, but is really little more than a collection of tents in the middle of a dry, flat landscape, surrounded by thousands of families with nowhere else to go. 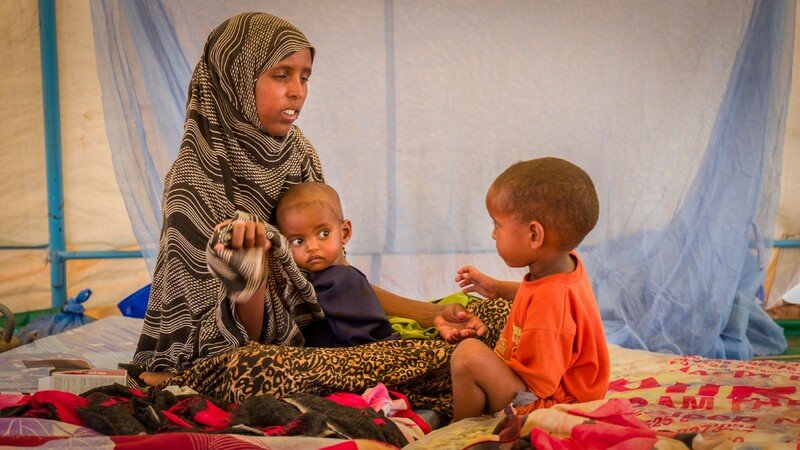 When Meriama Bile finally arrived here, her 18-month-old son, Faris, was in a dire state. Malnourished and feeble, the infant had been suffering from diarrhoea and vomiting for close to a month. The mother of two didn’t think her baby would survive. Faris had gotten sick after the family’s cattle died. Like most inhabitants of Ethiopia’s Somali region, farming was the family’s main source of income and food — meaning both died with their animals. Meriama had tried to support her family by selling incense, but before long she was mixing together globules of salt and sugar to feed them. Meriama sits with her young boys. Ethiopia is one of a number of countries across the Horn of Africa facing a growing threat of famine. 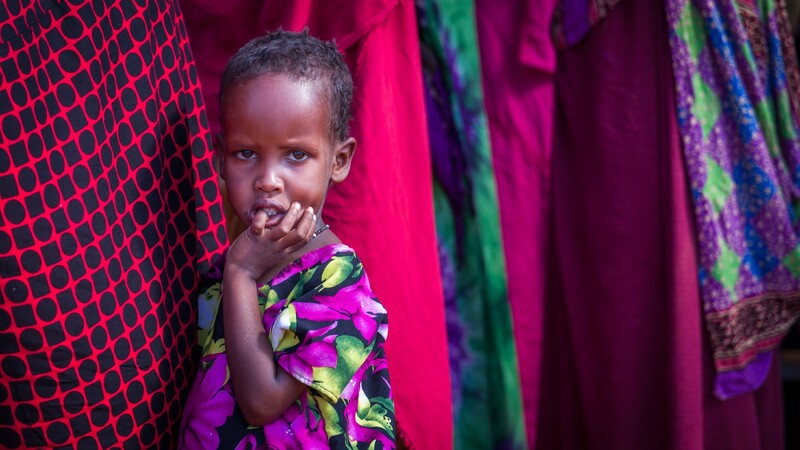 The drought is worst in the south and southeast, the Somali region, where almost six million people live. Last year’s rains failed, and if this year’s don’t arrive soon, around two million people will need help with food this year. The Dolo Odo district lies 30km from the Ethiopia-Somalia border. 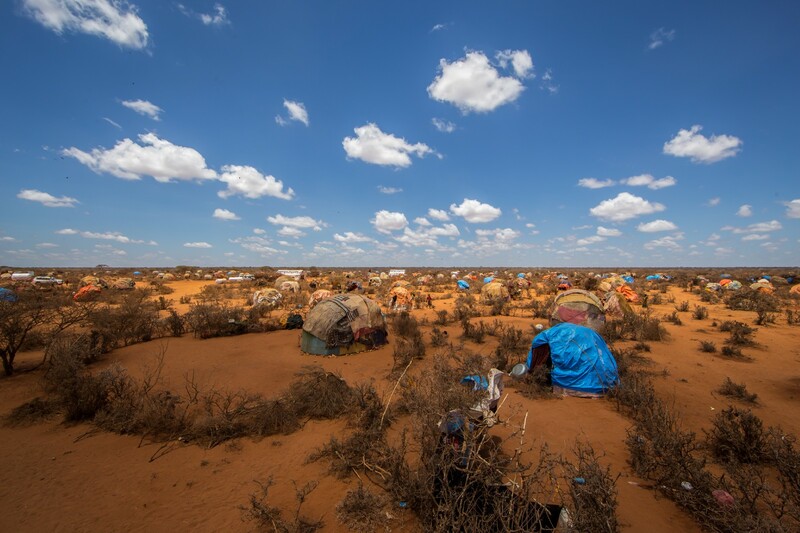 It is a landscape dotted with makeshift tents and skeletal shrub life as far as the eye can see. Communities displaced by the drought settle in makeshift homes. Khadija Alad has lived here her entire life. She has never experienced a drought this bad. Khadija, 48, who travelled for three hours to the clinic says her 2-year-old son. Khadija travelled three hours by foot to this small clinic because her two-year-old son, Abdinassir, had been sick for three months. This was her first opportunity to get him help. She says that Abdinassir is doing better now, but still must come back for regular checkups. 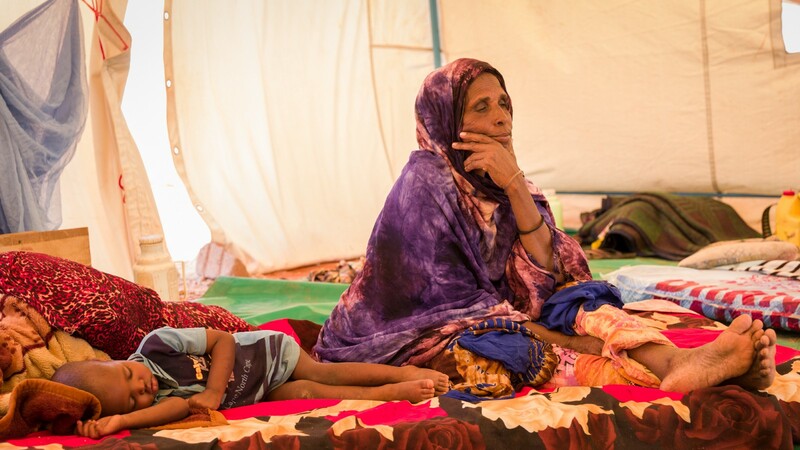 Khadija, 48, sits with her two-year-old son Abdinassir at the temporary clinic. 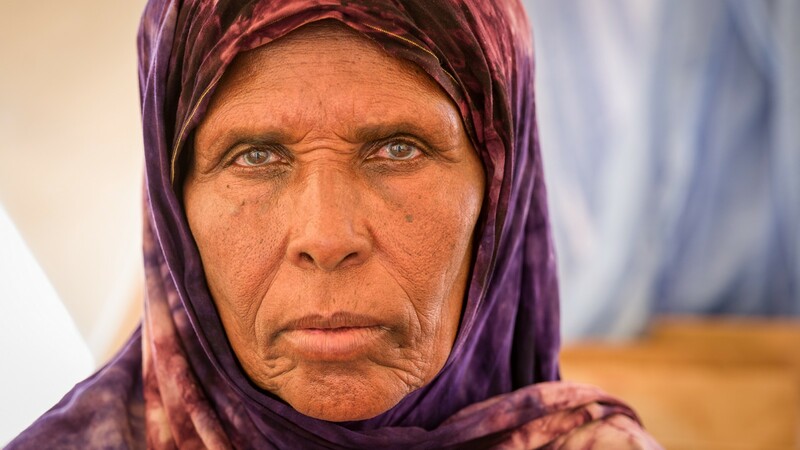 These temporary settlements are providing displaced people like Khadija with a home and much-needed medical attention. 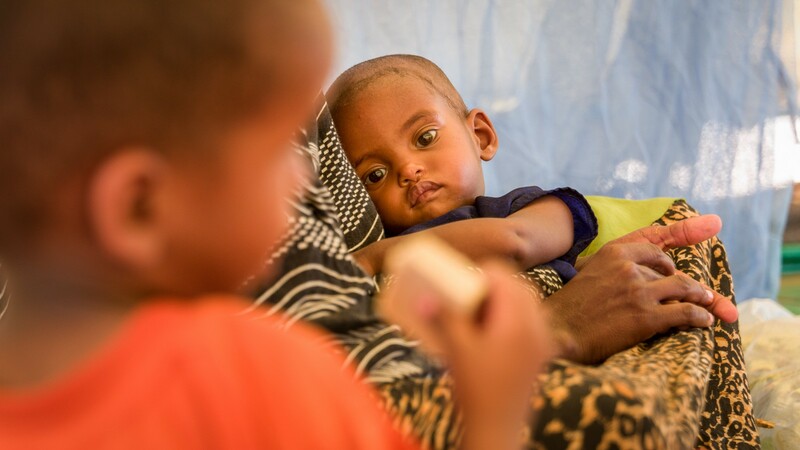 In 2017, the Somali region is expected to see more than 400,000 cases of severe malnutrition in children and new mums. But severe malnutrition isn’t the only symptom of this drought. The region is also grappling with outbreaks of sickness, a problem exacerbated by water shortages and crowded sites with poor sanitation facilities. Halima Abdi, 4, holds the dress of her grandmother. Khalid Kedir is one of UNICEF Ethiopia’s nutrition specialists, and says that the organisation will be scaling up its response to meet the needs of children. 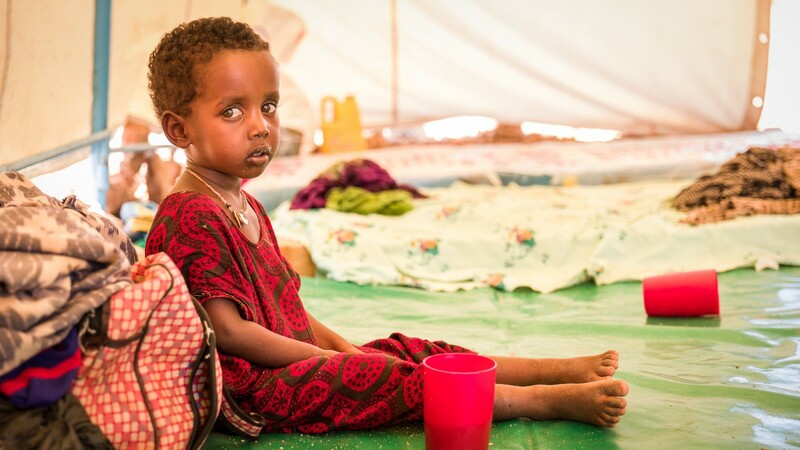 Nasteho, 2, malnourished from the effects of drought. While clean water and hygiene products have been provided to around 10,000 families, Khalid says education and awareness are just as important to halt the spread of sickness. It means that UNICEF is teaching people about the causes of waterborne diseases and how to properly use mosquito nets to protect themselves from malaria. Construction is also underway on three temporary learning spaces that will contain six classrooms in total. 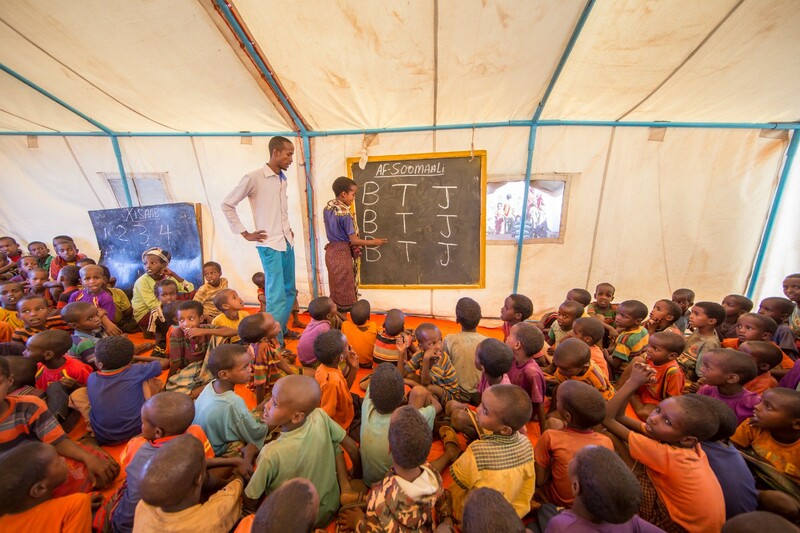 Currently, children are crammed into tents in order to receive schooling. A student reads words written on a blackboard to his classmates. This region is struggling, but even with the disease, drought and hunger that surrounds them, kids are still kids. The settlements are filled with the music of children playing. Between lessons, a handful of children twirl hula hoops around their waists. Outside, a noisy group of boys chase each other around the settlement, locked in a chaotic game of football. 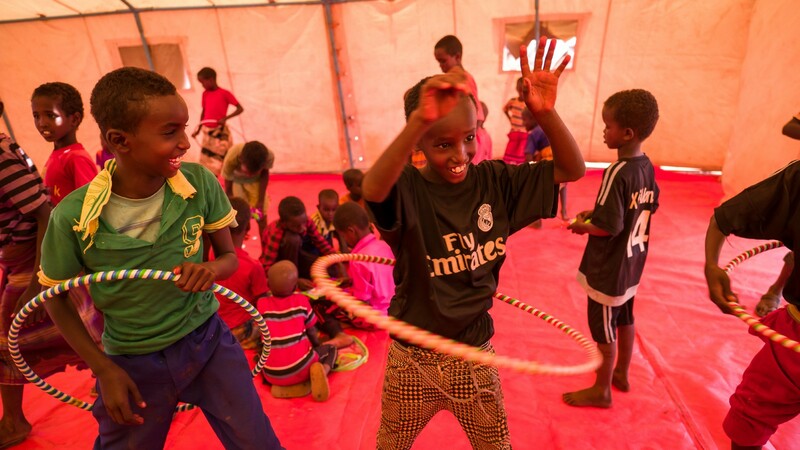 Somali boys play games inside a child friendly tent. Faris ended up being one of the lucky ones. For some time, it was touch and go, his broken body unable to accept food. But after three injections, he was finally able to be given glucose. Thirteen days later, his condition has improved to the point where he can be breastfed again. But the news isn’t all good. Meriama’s other son, three-year-old Abdrirashid, was not doing well. He barely has the strength to sit upright on his own. His resistance, non-existent. 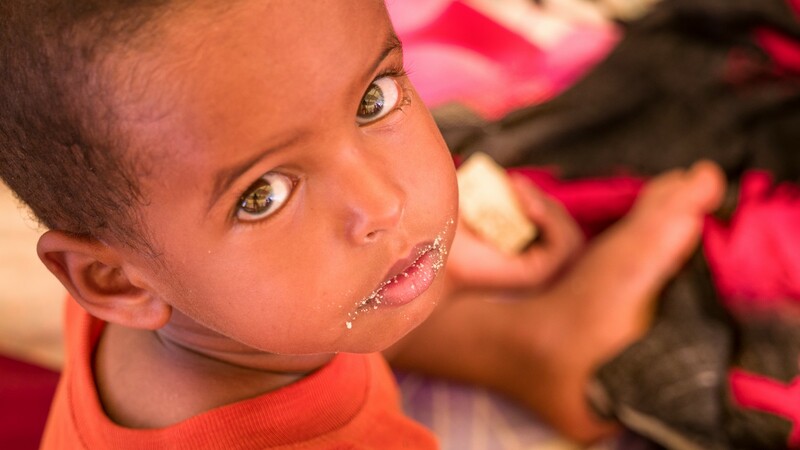 Abdrirashid, 3, eats a nutritional-enriched biscuit at the temporary clinic. The family sit huddled on the floor of the tented clinic, Meriama cradling baby Faris, and Abdrirashid propping himself against his mother. As Abdrirashid chews on a nutritional biscuit, Meriama watches, hoping it will make her young son stronger, and that she can return home with two healthy children. There is still so much that can be done to help children like Abrirashid and Faris. Even the smallest of donations can make a difference, and show these children that the world has not forgotten them.